NACE International was established in 1943 by eleven corrosion engineers from the pipeline industry as the "National Association of Corrosion Engineers." The founding engineers were originally part of a regional group formed in the 1930s when the study of cathodic protection was introduced. Since then, NACE International has become the global leader in developing corrosion prevention and control standards, certification and education. The members of NACE International still include engineers, as well as numerous other professionals working in a range of areas related to corrosion control. At the beginning of the 20th Century, little was known about the science of corrosion control. By the 1930s, however, significant strides in corrosion mitigation had been achieved and cathodic protection (CP) had come into widespread use to control corrosion on underground pipelines. This generated well-founded concern about possible damage to adjacent structures from stray current. It soon became apparent that a dedicated organization was needed to serve as a clearinghouse for information about underground operations and to establish standard procedures for installing and maintaining CP systems. This led to the formation of the Houston, Texas-based Mid-Continent Cathodic Protection Association in 1938. In 1940, the Petroleum Industry Electrical Association (PIEA) offered to sponsor the work of this group, which then became the PIEA Cathodic Section. Members of this section quickly determined the value of forming a separate association dedicated specifically to corrosion and its control. On October 9, 1943, 11 corrosion engineers agreed to found this endeavor, and the National Association of Corrosion Engineers (NACE) was born. The first officers to lead the fledgling organization were President R.A. Brannon, Vice President F.J. McElhatton, Secretary-Treasurer O.C. Mudd, and Directors G. Gorfield, G.R. Olson, R. Pope, W.F. Rogers, and L.R. Sheppard. In 1945, with 268 members, NACE was officially incorporated under Texas law as a not-for-profit technical association. 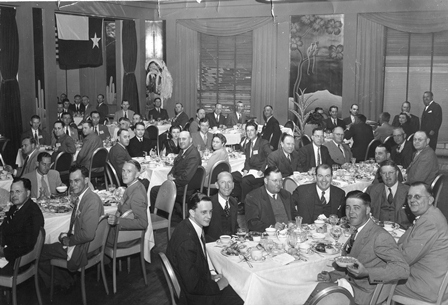 In 1946, the Houston Section was the first section formed and association membership grew to 801. The South Central and Western Regions were established in 1946, followed by the Southeast and North Central Regions in 1947. By the end of the 1940s, NACE had five regions,17 sections, and more than 1,700 members. NACE also began broadening its scope during its formative years, expanding beyond a purely CP and pipeline focus to include the oil and gas production, chemical processing, and refining industries, as well as other methods of corrosion control such as protective coatings and linings, chemical treatment,and materials selection and design. This, along with increasing public knowledge and concern about the costly and damaging effects of corrosion, served to fuel impressive membership growth throughout subsequent years. Today, the association (renamed NACE International—The Corrosion Society in 1993) has four areas and 80 sections in North America, four international areas with 62 sections, and a total of nearly 36,000 members from 130 countries. In addition to NACE headquarters in Houston, there now are staff offices in San Diego, California; Shanghai, China; Kuala Lumpur, Malaysia; Al-Khobar, Saudi Arabia; and Sao Paulo, Brazil.